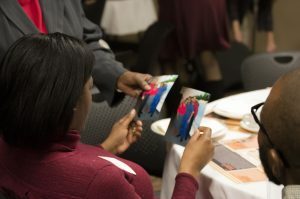 A semester of learning concluded with a gift of caring when two First Year Seminar (FYS) classes collaborated recently to host a dinner party for a family of 40 on behalf of their incarcerated relative. And the sentiment, “Wish you were here,” took on difficult and obvious poignancy this Christmas. 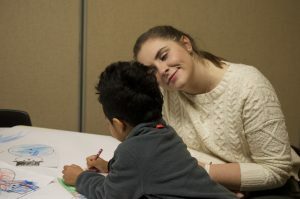 Students in Professor Tori Pelz’s FYS, Jails, Justice and the Artist’s Response, joined forces with Professor Deb Coyle’s FYS, Comfort Food, to serve as proxy hosts for Gregory, a local inmate and poet. 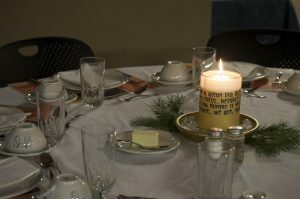 Together, the two classes threw “Gregory’s Dinner Party,” a solemn but festive gathering which provided lessons in empathy and social-change engagement for Hope students as well as comfort and newfound pride for Gregory’s family. The event was the culminating project for Pelz’s class that explored how socially engaged art could be a vehicle for pursuing social justice, specifically in response to mass incarceration. “Too many times we see mass incarceration as an abstract issue but it’s a human one, of course,” says Pelz, assistant professor of art. 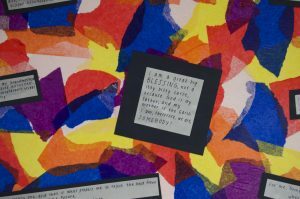 “So, I wanted my students to experience how art could take the form of radical hospitality, as they created a hospitable environment by listening to and enacting the wishes of their incarcerated collaborator. One of Gregory’s poems artistically displayed. Though the event was Pelz’s idea, Gregory choreographed every aspect of the evening, from the menu to the décor. Her students corresponded with him during the semester to ask his wishes, learning about what he would want if he were indeed the one to be the on-site host. His poetry was the centerpiece of the evening, providing content for the students’ performances and visual displays. Students also contributed their creative gifts through harp music, singing performances, and artistic displays via placemat design and other decor. The family joined in as well, spontaneously singing gospel songs and offering toasts to Gregory. Professor Tori Pelz and one of Gregory’s young relatives. Separated by decades and significant miles, many of Gregory’s relatives struggled to regularly visit him over the years, and some of the younger relatives had yet to meet him. Time and distance can move memories into fading, and up until a week before the event, Gregory had communicated that only three family members would be attending his dinner party. Yet, when word got out to more of his extended family, the guest list grew to 40. And on the first snowy night in Michigan this winter, several carloads of his relatives drove across the state, from Detroit to Holland, to reconnect with Gregory in absentia. As his family sat down to write him postcards that evening, the one person not physically present in the room had the strongest aura. Gregory was not there but he was, too. And that was the entire point of the evening. As his family sat down to write him postcards that evening, the one person not physically present in the room had the strongest aura. Gregory was not there but he was, too. And that was the entire point of the evening. Gregory’s aunt writes him a postcard. 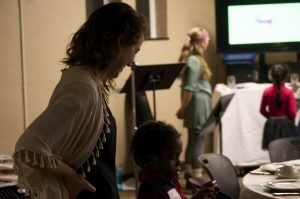 Hope student Kelly Harris and one of Gregory’s young relatives. Course goals were met and then some for Pelz’s students. While they came to know critical factors that contribute to the current state of mass incarceration in America and how certain works of art can lead to conversations about that issue, they also gained empathic wisdom, greater compassion for the incarcerated, and memories of an evening they’ll never forget. “I spent a lot of time in this class thinking about my own flawed assessments of forgiveness, rehabilitation, and the hidden populations in America,” freshman Leah Krudy explained. “Meeting a group of kind people made for a nice evening, but seeing a family capable of such resilience was truly powerful.